To critique an exhibition-in-progress can provide a companion to viewing. Imagine a thoughtful and well-informed docent walking alongside, commenting briefly but incisively. However, this gentle character fades into the smells and shadows of the museum with the end of the show. After it has closed, critique demands other methods. It must, by necessity, be more social, less encyclopedic, and more polemical in its conclusions, eliciting comparison to past exhibitions that were similar either in topic or format. In other words, this sort of critique must summarize and contextualize. Its job is to make new history. Conveniently, the title of the second Chicago Architecture Biennial in 2017, echoed Ed Ruscha’s edict from 2009: MAKE NEW HISTORY is printed huge, three times, across the exhibition catalogue cover, front and back. To its credit, the show often lived up to this mandate, providing an overview of a discipline in the throes of profound transformation as it harkens to a past that architecture cannot not represent. History, that “perversity” separating us from the “natural,” that passion to hoard and control an “increasingly complex” past, at least in its telling, gelled as an “objective” medium a mere two and a half centuries ago. The Enlightenment overturned all that had gone before, cultivating a discipline that recorded, analyzed and refined the ungovernable detonation of data and ideas. The anguish represented by Diderot’s Encyclopédie, ou dictionnaire raisonné des sciences, des arts et des métiers of 1751 resulted from the sense that, given the expansion of technology, fact and theory, there was far too much to know. The consequent frantic attempt to contain the overflow resulted in the Encyclopédie, but also in the macabre cult of ruins, in de Sade’s anthology of pain, and in attempts to escape Rousseau’s “chains”. In uncertain waters like those encountered due to the expansion of global research and exploration in the eighteenth century, methods became “scientific.” The illusion of pure objectivity prevailed. But history immediately allowed the newly acquired information to serve hegemonic aspirations, political and economic. Previously, records of past events and discoveries had the same permissiveness, the same “poetic” autonomy and cultural authority associated with myth. More immediately, in the last half-century, power relations and wildly advancing knowledge have fed a flood of “New History”—no longer totally constrained by religion or state authority nor by the need for closure. Provocatively paraphrasing Marx & Engels’ Communist Manifesto, Torsten Lange suggests that the discipline of architecture has returned to many of the conceptual trappings that accompanied Postmodernism from the 1960s to the 1980s, an era that emphasized history as an essential component of practice. The Chicago Biennial aims to confirm that architecture has indeed resuscitated these concepts, if not the florid forms they accompanied. Three decades ago these went out of style along with the flamboyantly referential shapes and tints that characterized Po-Mo. Fashion can be both harmful and productive for a discipline like architecture. Like a refreshing downpour, a change in fashion clears away the stale and silly, and makes room for novelty and revival. Without leaving scars, the ideas that accompany form must not so easily wax and wane. Yet they often do. History this year, gone the next, only to return a generation later. It appears to be a daring epistemic leap to again bundle together the various twigs of historical thinking and historicist formal reference that became Postmodernism and maintained some credibility through the eighties. On one hand, there was an archetypal problem. By appearing jovial to the point of ridiculousness, the frivolity and polychromatic iconoclasm that characterized Po-Mo’s Anglo-American endeavors easily accommodated the crass and far-from-munificent desires of late capitalism and its hyper-aggressive probe-organ, real-estate. In addition, lengthy production time and conspicuous finances involved in architecture’s actualization as buildings are both guaranteed to encourage a conservative bias toward the past and present. Po-Mo seemed to propitiously ignore hard economic facts for the sake of cleverness. In the US plutocrats were the big winners. Now, three decades later, the revival of forms and history certainly serves, to a degree, the same masters in an increasingly neoliberal millennium. But other, more complex, and potentially benevolent impulses can also inform this “new history.” As well Po-Mo was perceived as a global phenomenon and often derided for being so. But, as Lange points out, to conflate the American pink-keystone sort with always Marxist, profoundly urbanistic, and sometimes severe European Neo-Rationalism, as was done in the sixties and is again proposed, was to combine two tendencies so different that pitched roofs and symmetry seemed the only intersections. It could be that Make New History simply urges crass notoriety. But it is possible, and presumed here, that the process of crafting history involves both its use as a model and, more excitingly, as a prototype for unprecedented actions that resist the worst and fuel the best inclinations of an extremely troubled present. To that end, episodes of the Chicago Biennial are critically assessed as “cases” in the double sense of vitrines that display examples and those cases that are immortalized in an infinite array of police dramas. Both meanings imply a certain disconnection between each case and the next. That dissonance continues here. New history forgoes the attempts toward complete and seamless narrative. Like Ruscha’s floating epigrams, the Dutch firm Manadnock’s installation in Chicago aggravates and proposes. 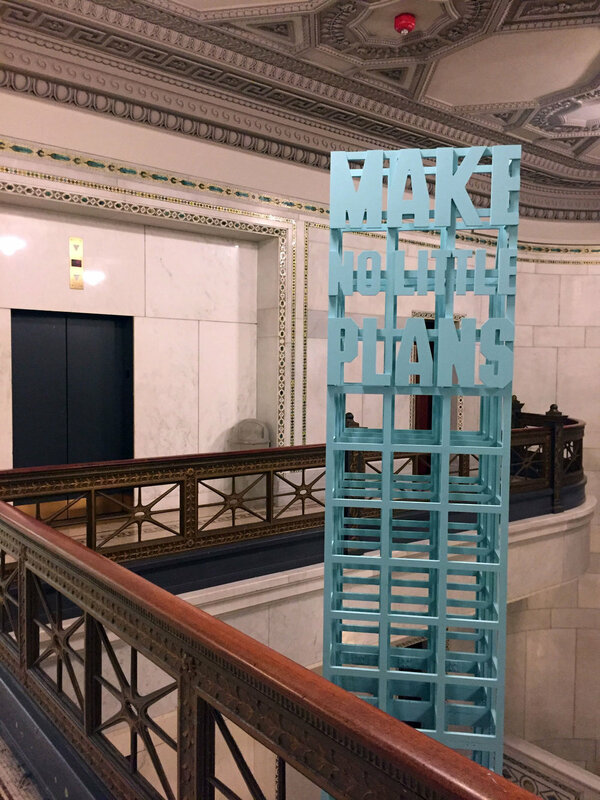 Their grand structures that carry Burnham’s “MAKE NO LITTLE PLANS” and “MAKE BIG PLANS” on the staircase of the Chicago Cultural Center, the site of the Biennial, declare “...it refers to a possible structure of a building.” As Burnham insists, big plans reach aggressively into the future. Incalculable scale gives license to filling in space, particularly urban space. Most “planning” is visionary in the sense that it will not be actualized as such but rather works as provocation, as a catalyst for change like Burnham’s extraordinary plans for Chicago. The concept of bigness did not begin with Rem Koolhaas, whose ironic application of the concept to urban design, while superficially a descendant of Burnham’s, is simultaneously wildly enthusiastic and pessimistic. The aforementioned complexities of Po-Mo gave license for such paradox. For Manadnock, the exposed frame of the Chicago School, the aggressive expression of force, literal and economic, becomes the imagined flesh of the skeletal sign/building and repeats the orthogonal pattern of the city itself. Today that crusty old term “typology” is rather vaguely but promiscuously thrown around at architecture schools and in offices where, a decade ago, it would have elicited discomfort or even disdain. In any case, critical history is back, and welcome; and sometimes new! If “typology” meant a shifting idiolect of forms in many disciplines, then a “new” or possibly transformed version is indeed enticing at this point. 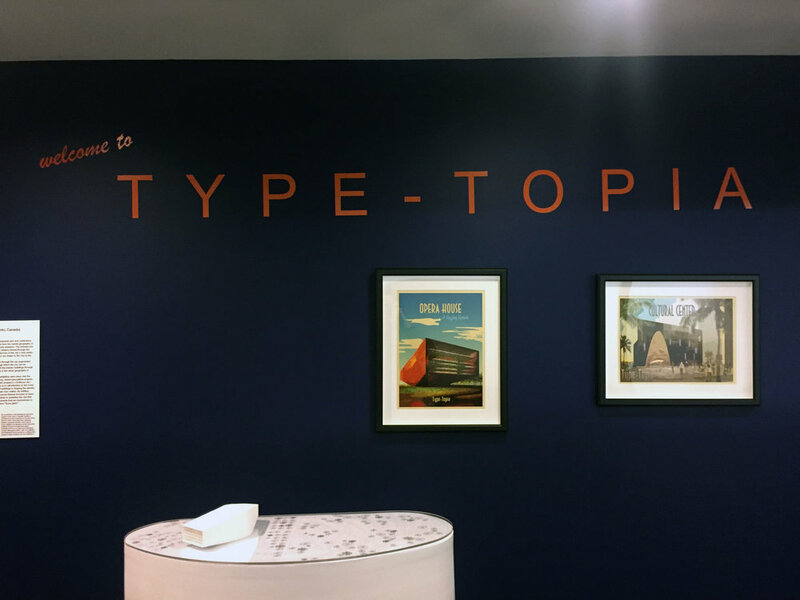 CASE 2: At the Biennial the work of Khoury Levit Fong is displayed under the slogan “welcome to TYPE-TOPIA.” Their strategies are made even clearer by the display of simplified massing models. They refer to these disparate designs as a “fictitious city” further aligning their work with a typological and urbanistic continuum where type recognizes a somewhat universal understanding of shapes and that the city is the datum by which individual objects, monumental and quotidian, define relations and manifest autonomy. They may take cues from local forms and urban facts but with exquisite inventive acts that rely on materials and the movement of bodies. The Liwan Beirut deftly refers to the organization of the grand Mamluk courtyard palace. From the arched entry a counterclockwise route spirals up through the equivalent of loggia and iwan. Likewise, on the particular qualities of territory, the firm remarks: “Much like the Lebanese rocky landscape whose physiognomy is shaped by the persistent action of natural and human forces, Liwan Bayrut’s hard-edged constitution is carved out and softened by the teaming forces of its urban context.” The specific language of MIddle Eastern building is thus restated without losing its rhetoric. “Unprecedented Realism,” one of the most provocative tendencies of the first Po-Mo episode, has direct impact on this firm who were integrally involved then and clearly remain so. The projects shown are metamorphic, products of the rich alchemy of facts and invention impelled by analysis at all scales but particularly by the city. Since the end of the nineteenth century the Bienalle di Arte in Venice has historically presented what are determined to be the best and most novel of the fine arts. In 2017, it coincided with the Chicago show. While there are differences, art and architecture present very similar rhetoric, and, not surprisingly, analogous installations and events. These sorts of shows typically attempt to sort, to steer, or even to preemptively create new agendas for various disciplines, in particular architecture. The first Venice Mostra Internazionale di Architettura was not inaugurated until 1980, when Po-Mo was well ensconced. Like the Modern Architecture: International Exhibition curated by Henry-Russell Hitchcock and Philip Johnson at the MoMA in 1932, the Venice show attempted to bring together worldwide practitioners of Po-Mo under the title La Presenza del Passato (The Presence of the Past). At this high-water-mark of an era that proclaimed it had supplanted Modernism, Aldo Rossi's Teatro del Mondo floated at Venice’s Dogana. At the "Strada Novissima" all the then-current stars lined up their historicist offerings along the interior street of the Corderia, invited by the impresario of Post-Modernist Rococo, Paolo Portoghesi. Beneath torrid and loosely applied makeup, hyperbolic Po-Mo facades redolent with symmetry, fearful at times, confirmed the intense, if short-lived, enthusiasm for what then promised to mark a sea change. Anxiety radiated from the Strada’s facades and continued throughout the Biennale, repeating homages to designers, from Palladio to Luigi Moretti, who would certainly have been shocked to be so honored by exaggerated yet intentionally devalued references to their work. Like an acqua alta, the excitement of 1980 quickly receded, but many, who would later be embarrassed by their acquiescence to this odd episode in the evolution of Modernism, were only too willing then to mount keystones and flaunt pastels. CASE 3: “Whatever this is, it is on the verge of nothing-in-particular. It is a ghostly figment of something... It is an average. It is a technical marvel. Maybe it is a knowing wink toward quote-unquote history. Maybe not. It couldn't care less or more.” So reads MOS’ second resurrection of the Chicago Tribune Tower Competition—1922, 1980, 2017. Ironically their apparently “average” proposal eerily reminds that history plays tricks even on the most alert collective. MOS’s is a dead ringer for the Murr Tower, Beirut’s tallest. From the Murr, mostly civilians in East Beirut were picked off by snipers during the decade-and-half of civil war. It is now a haunted, empty skull with hundreds of eyes. At one point militias managed to haul a Katyusha missile launcher up the forty stories to blast across the city. Likewise snipers from the east shot at the west, and at the Murr, from the Risk Tower and others. Murr, along with the equally scarred Holiday Inn nearby, stand as ghoulish monuments, in the most literal sense given the funereal origins of the term. Two decades after the end of war, they still tower as morbid ruins. At the 1988 Deconstructivist Architecture Show at MoMA, Philip Johnson again attempted to congeal architecture into one coherent act of incoherence that suited the perpetual impulse in architecture to accommodate capital and its follies. His genre of neo-expressionism did so with enthusiasm. Except for Russian precedents, history faded from the discourse, tarnished by the almost Freudian need for each generation to commit patricide in order to clear room for work and ideas that inevitably reflect those of the freshly slaughtered “parent”. The project is another modeling of setback profiles that have been regularly instituted in vertical cities for exactly a century. New York City’s 1916 Building Zone Resolution required setbacks for tall buildings and this also satisfied a desire for picturesque “natural” profiles, for mountains like those painted voraciously to the north of the city by the Hudson River School in the 19th century. While quickly gaining aesthetic cachet, these regulations resulted from the demand for light and air where towers, particularly the Equitable Building in lower Manhattan at 120 Broadway, threatened to suffocate the metropolis. Designed by Ernest R. Graham, Daniel Burnham’s former associate, the 38-story building, erected on a tight lot in the oldest part of Manhattan, terrified its citizens. If repeated, it would have produced an impossibly dense skyscraping maze, particularly where the streets were so narrow. The largest building in the world, the Equitable’s 1,200,000 square feet of rentable office space held a daytime population of 16,000 workers. The presence of hundreds of such structures would have terminally burdened lower Manhattan with hordes of workers crowding streets and transport to the point of catastrophe. The films Metropolis, Things to Come, Blade Runner and The Fifth Element, employ such dystopic images. Hugh Ferriss’ smoky and beguiling renderings showing a progression from smooth triangles delineated by zoning laws to the almost equally naturalistic setbacks, set the standard for Chicago as well as New York, defying the Chicago School whose earlier framing innovations had revolutionized construction and urban imagery. Encouraged by Modernism after the Second World War, the 1916 rules eventually succumbed to the desire for smooth towers. Again, every generation reverses the rules. Most of a century later, Ferriss’ work, in particular his literal reification of the setbacks, predict myriad projects for actual pointed towers, many built or under construction in the last decade. This Harvard project does seem to propagate that commercial model across Chicago again. A beguiling field of these shapes repeats the formula that has generated domestic skyscrapers for oligarchs worldwide. Waldheim’s flashy or at least expensive-looking display addresses both history and politics, for Rolex/Vuitton City is already there, from the shores of the Arabian Gulf to Lake Michigan. Given the relatively miserable job Po-Mo made of it, and given how easily they, and the Deconstructivists who followed, accommodated the demands of capital, any show like Chicago’s with its impulse to bring the dialogue to a much finer pitch, must locate how and where designers may go about doing so. Such geographic/ontological research is conducted by the exhibit with great variation. They may appear abstruse, but the actual, whether material or political, guides both 2017 shows in Venice and Chicago through the “histories of the immediate present” that Tony Vidler describes. Since the current neoliberal freefall appears to be permanent in its adjustments, it is indeed a very difficult moment for a discipline so central to the gaze of power and money. Having found that their client base to be moving toward the private sector and the lucrative fantasies of developers and privateers, architecture and art, always the canary in the mine, profited destructively during the period of Po-Mo. In subsequent decades architectural quality improved in an almost inverse proportion to world economy. Extraordinary things happen when Rome gets sacked or booms bust. Maximum evolution seems to occur at those catastrophic moments when architecture detaches from power, not when it serves. It is forced below the radar and passages are found other than those provided by a dominant political economy. Having lost most commissioned work when the planetary economy collapsed in 2007, many architects gravitated toward some form of critical perspective. At the Biennali of Chicago and Venice, architecture and art, hand in awkward hand, have had to confront the conditions that seem to be in process of dismantling and reshaping all aspects of current practice as they swing their febrile gaze once more towards critical history. Michael Stanton was born in London but raised in Baltimore's Bolton Hill, across the street from the Maryland Institute College of Art, where he painted as a pre-teen, and where he now teaches in the architecture, art history, and humanistic studies departments. He was educated at Antioch College and Harvard and received his Master of Architecture from Princeton. He is a designer, writer, and teacher. The Washington Post headquarters is a building he designed with the firm Hartman Cox. He is the winner of competitions and exhibitor in art and architecture. He has taught and organized workshops on four continents with longer appointments at Tulane University and the American University of Beirut, where he was Chair of the Department of architecture and design. The author of numerous articles and book chapters, he is now completing a book on the American city in the context of paradox.